Basil has this amazing fragrance that is so irresistible! Whenever I go to the farmers market I always pick some up, although the bunch it comes in is so big that in order not to waste any I either share some or I make pesto sauce and freeze it. Nothing goes to waste! 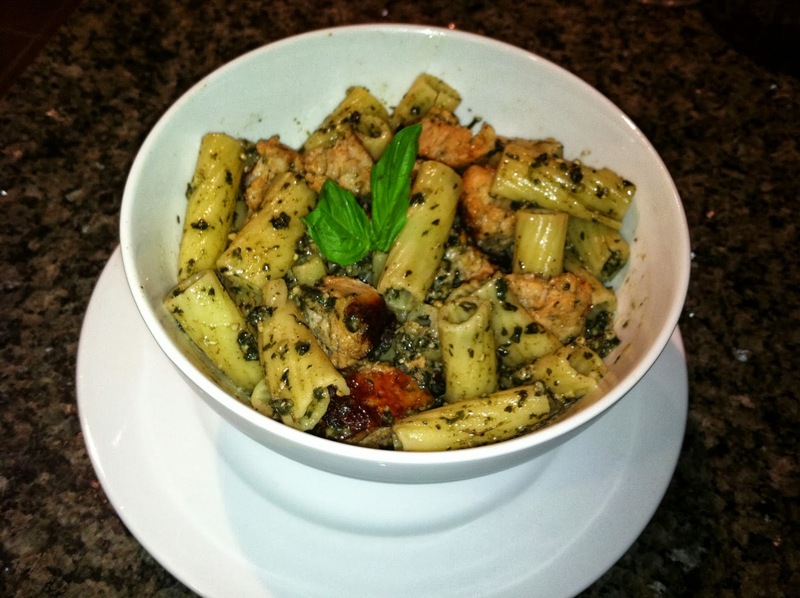 This pesto sauce was made with some beautiful purple basil! I mixed it with some rigatoni pasta and added chicken sausage. So simple, healthy and delicious! Eating basil on a regular basis helps to protect your heart and promote cardiovascular health. Basil is a good source of beta carotene and magnesium, which promotes heart health. Rinse the basil leaves in a large bowl of cold water to remove any debris. Remove and dry the basil either in a salad spinner or between paper towels. Place the pine nuts, and garlic in a food processor fitted with a steel blade. Process for about 30 seconds. Add the basil leaves, salt, and pepper. With the processor running, slowly add the olive oil through the tube feed until it is finely pureed. Stop the processor and remove the cover. Add the parmesan cheese and process to incorporate, about 20 seconds.